Kwara State Governor-Elect AbdulRahman AbdulRazaq has described as shocking and regretful the sudden death of the Etsu Pategi Alhaji Ibrahim Chatta Umar. AbdulRazaq said in a statement by his media aide, Rafiu Ajakaye, that the first class monarch's legacy of uniting his people for peace and development will be missed. 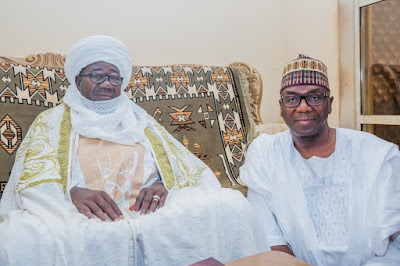 AbdulRazaq condoled with the Kwara State Government, the Emir of Ilorin and the people of Kwara North on the passing of the Etsu Pategi, who was vice chairman of the state's traditional council. “Specifically, we commiserate with the immediate family and people of Pategi on this sad loss of their monarch and pray the Almighty Allah to stand by them in this trying period and grant the Etsu Pategi aljannah Firdaus,” the statement added. The monarch died late Tuesday in the Nigerian capital Abuja and will be buried Wednesday afternoon in Pategi.